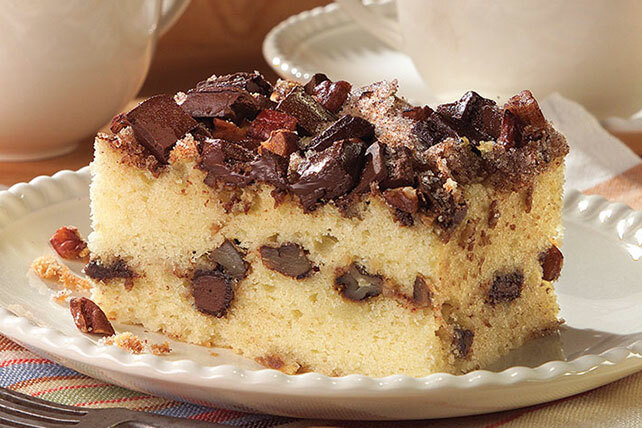 Skip the line at the bakery to make our Chocolate Chunk-Cinnamon Coffee Cake Recipe! This cinnamon coffee cake recipe is easy to make and delicious. Combine chocolate, nuts, cinnamon and 2/3 cup sugar; set aside. Mix flour, baking soda, baking powder and salt. Beat butter and remaining sugar in large bowl with mixer until light and fluffy. Add eggs, 1 at a time, mixing well after each addition. Blend in vanilla. Beat in flour mixture alternately with sour cream. Pour half the batter into 13x9-inch pan sprayed with cooking spray; top with half the chocolate mixture. Repeat layers. At 32 servings, this coffee cake will make a wonderful addition to any brunch menu. This moist coffee cake can be prepared ahead of time. Cool completely. Wrap in plastic wrap, then foil. Freeze up to 1 month. Thaw overnight before serving.